Farming is in the blood for Jamie Halbert and he chose the unusual and difficult route as a new starter in agriculture. Now, at 29, running his own farming enterprise single-handedly near Hadrian’s Wall, he has found the Galloway cow to be ideal for ease of management and suiting the system on disadvantaged land which has high importance for access, history and the environment. Jamie bought 105 acres in a ring-fence at Chapel House, Gilsland in November 2005 Further opportunities came along with the purchase of another 108 acres on Hadrian’s Wall and then the rental of 100 acres of hill land and he is now running 350 acres in total. Initially, he set up a herd of three quarter Limousin-British Blue suckler cows, crossing them all with the Limousin bull and selling the May-born calves the following March. “Last year’s batch of calves averaged £700 but there could be as much as £500 associated with producing each calf in terms of feeding, silage fertiliser, without considering the capital outlay, and it wasn’t paying,” said Jamie. “I decided to look for a system that suited me. Because I’m running such a small enterprise I don’t have the economies of scale. “I couldn’t afford to build a muck store or cubicle building to cut down on my straw bills so I looked at building a sustainable system in which I could go forwards, not backwards. And that’s where the Galloways fit in,” he added. He also worked part time at Gapshield, Gilsland for Willie and Christine Wallace where he had worked since he was 15. This was followed by an HND in agriculture at Bishop Burton College. Keen to go into upland farming, he took a job on a hill far in north Northumberland, followed by working with pedigree Suffolks in Wiltshire. He returned to the north to work for Graham Dixon at Alwinton where he leanrned a lot, including how to train sheep dogs, and he worked there for three years until the opportunity came to buy Chapel House Farm at Gilsland. “I wanted to rent somewhere that was bigger but my mum, Sally, whose family had been in farming, suggested that I bought a small farm and with the help of my dad Robin I started with 105 acres,” said Jamie. This land comprises 45 acres of in-bye and 60 acres of what Jamie describes as ‘bog’. At Chapel House, the line of Hadrian’s wall runs under the cow shed and the house is built on a military track. The farm is currently in Entry Level Stewardship and because of the importance of access in the area with several footpaths including the Hadrian’s Wall path crossing the land, Jamie is hopeful to join Higher Level Stewardship in 2010. Even with a further 115 acres in ELS near Hadrian’s wall subsequently purchased with the help of his father and uncle Doug and 100 acres of rented rough hill land qualifiying for HLS on the Wall next to Kielder Forest, Jamie still has to supplement his income with fencing and contracting jobs as well as breeding and training collie dogs. “That’s why the Galloways suit my system because I’m doing a lot of other work. With the Limousins I was up calving cows in the middle of the night, I was under pressure for winter housing and I was struggling to produce enough silage,” said Jamie. “After a visit to Kirkstead, Yarrow, I decided it might be more sense to have a native breed and then I was surprised at how Galloways would do. I had sold the Limousins within a couple of weeks by February 2009, just in time for the early Galloway sales. “I was very impressed with the Galloways I saw in Scotland both privately and at the Castle Douglas sale. I bought seven heifers, five bulling and two in-calf, privately from Stuart McIntosh at Outer Huntly which were very healthy animals. “I purchased a further five in-calf heifers from Alan McClymont, Kirkstead, Yarrow, which all produced live calves and three bulling heifers at the Castle Douglas sale, paying 2,000gns for one from Barlaes, as well as a stock cow and two heifer stirks from the Todstone dispersal,” said Jamie. The herd now numbers 21 cows which are run with a bull bought with Hunter Smith of Wylie Syke from Ian Thompson and David Preacher at Holly Lea. The sale of the Limousin sucklers has enabled Jamie to establish the Milestone Galloway herd as well as renovate the farm house and allow him to move out of his accommodation in a caravan at the farm. Optimum herd numbers for the land currently farmed will be 30 cows run alongside 320 ewes plus ewe hoggs, 220 of which are Hexham type Blackfaces, all but 20 of which put to the Bluefaced Leicester, are bred pure. Of the remainder, 60 are Mules with 40 pure Texels. A Beltex ram was used for the first time in 2009. Any surplus Galloway females will be sold as bulling heifers or be finished with steers at 26 to 28 months old, aimed at the specialist butcher. At Chapel House there is housing for up to 40 youngstock. The cows are being outwintered with a maximum of 16 on the HLS hill land which runs up to 1,000ft above sea level. 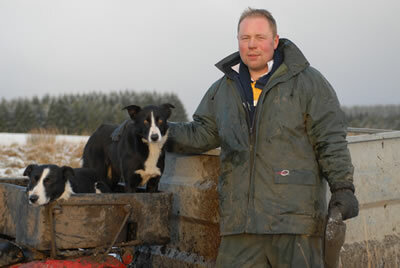 “The Galloways have helped me to secure the rented land for which the owner receives the HLS payment,” said Jamie. “I couldn’t have sent the Limousin cows there and they would not have been suitable for the scheme. With the Galloways being a medium-sized cow they don’t damage the ground. They also have a very even grazing pattern grazing off rush and poor hill grass which goes hand in hand with the sheep. “I am expecting that the Galloways will also help me in my application for HLS. “Management of the Galloways is minimal. While I still give them a mineral bolus and treat them for fluke and worms once a year, my reliance on conserved forage has been massively reduced. “In 2008 we housed the cattle in October and if we hadn’t sold them early the next year it would have meant seven to eight months of winter housing and the cost of straw and probably extra silage. Now 75 per cent of my herd is not housed at all and will only be fed some silage as the winter worsens after Christmas. I feed a small amount of cake to enable me to check and move the stock on my own but they are very placid. “”In 2009 I used no nitrogen fertilise and, if possible, I won’t be using it again, only P and K.
The plan is to establish a principally spring calving herd with calves taken off their mothers in the New Year and grazed and wintered at Chapel House for two years. With the ewes starting to lamb with the Texels from February 20, Jamie times a break so that he can supplement his income doing another lambing for a neighbour before starting again with the Blackfaces and Mules from April 16 outside. All the Texel lambs not retained as breeding rams are finished along with half the Blackies. A small number of ewe lambs are also sold for breeding. Last year 11 Texel shearling tups sold at Hexham in mid-September averaged £560. The intention is to sell a pen of Blackface tups at Hexham each October.